The Powerpoint TV box is the only fully approved Saorview Connect set-top box on the Irish market. Saorview Connect is the next generation of Irish TV experience. Launched in partnership with Powerpoint, it offers Irish viewers a premium TV experience with No Contract or Monthly Bills. Other set-top boxes on the market are unapproved and their usage is in no way guaranteed. Connect to Saorview with a Powerpoint box and get access to the best in Irish TV. Add your existing or new satellite dish and get access to additional free international and UK channels. Connect to your Broadband and get access to 100’s of hours TV from the RTE & TG4 on Demand Player. RECORD your favourite TV programmes. Now you can watch and record all your favourite TV programmes. Choose to either record a single episode or series link an entire series. Once recorded, the recording menu shows all your recordings. It also identifies the recordings you have watched and those you have yet to watch. Simply connect an external USB drive and you can record all your favourite TV programmes. Recommended retail price for the Powerpoint box is €159.99 This may vary from store to store. Further installation charges will apply depending on whether you need an aerial and/or satellite dish installed. If your home currently has both the device is easily set up. You will require an aerial, twin LNB satellite dish & broadband connection. The Powerpoint device functions perfectly well without the internet. However, in order to access services such as on-demand tv and spotlight an internet connection is required. Yes. Recoding is now available on all Powerpoint boxes. For those with an existing Saorview Connect set-top box simply follow the on-screen instructions for a software update to enable the new recording feature. It's a simple set by step process and once complete recording will be added to your main menu. Then, simply connect an external USB drive and you can record all your favourite TV programmes. For all new purchases, recording will automatically appear in the main menu. N.B. You will require a twin LNB & twin satellite feed to get get full functionality when recording on satellite. An external hard drive is required to record. What is the difference between this and other streaming boxes I have seen on sale? This service is licensed, legal and fully supported by Saorview. It is secure, user-friendly and simple to use. It will not switch off and you will not lose channels. It comes with a preprogrammed list for Irish, UK, and International channels. We have selected the top watched channels for your convenience. 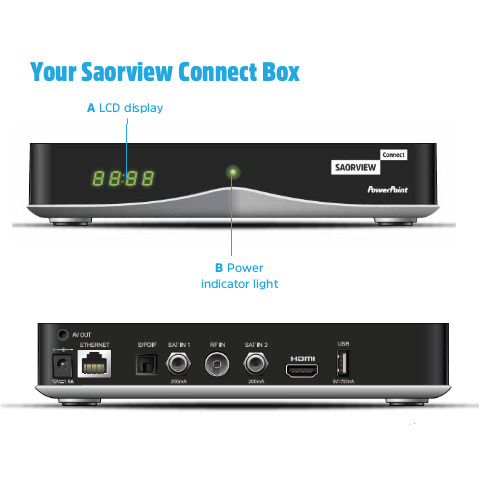 What is the difference between Saorview and Saorview Connect? Saorview Connect is the next generation Saorview. It uses internet connectivity to allow viewers to operate the On Demand TV Players and to scroll forward and backward to watch shows they've missed. It also allows viewers to connect via a mobile phone using the Saorview Connect app to review what is on and set reminders to watch whilst on the go. Visit https://www.saorview.ie/ to learn more. Saorview Approved products are designed to work with Ireland's Saorview TV service, and have undergone rigerous testing to demonstrate this. This Powerpoint Connect Box is Saorview Approved.